Hi all! I was pointed here by a collector after asking him a question about a little sword I've recently ended up with. I'm sorry if there's a section/thread for this, I looked around but didn't see anything. I picked this up for $100 a few months ago. It came from the estate of a collector but with no provenance and no identification. All I know is that collector was located in Virginia. It is very solid and quite hefty, definitely not a toy. It has had some rust scrubbed (not by me). The quillon was shaped with hand tools and is held on at the base of the hilt by the peened tang. I can't find any markings on it whatsoever. The edge does not follow the grain at all, giving me the impression that the blade was cut down from a much longer sword and probably given a new crossguard and hilt. It is 1 1/2 inches wide at the ricasso and the tang is about 5 1/4 inches long. The blade is a hair over 1/8th of an inch thick at the spine. It has been scrubbed for rust in the past and it looks like before it was cut down it had some dark (black? hard to tell) paint for rust protection, which is intact around the ricasso, but not really visible in the pictures. 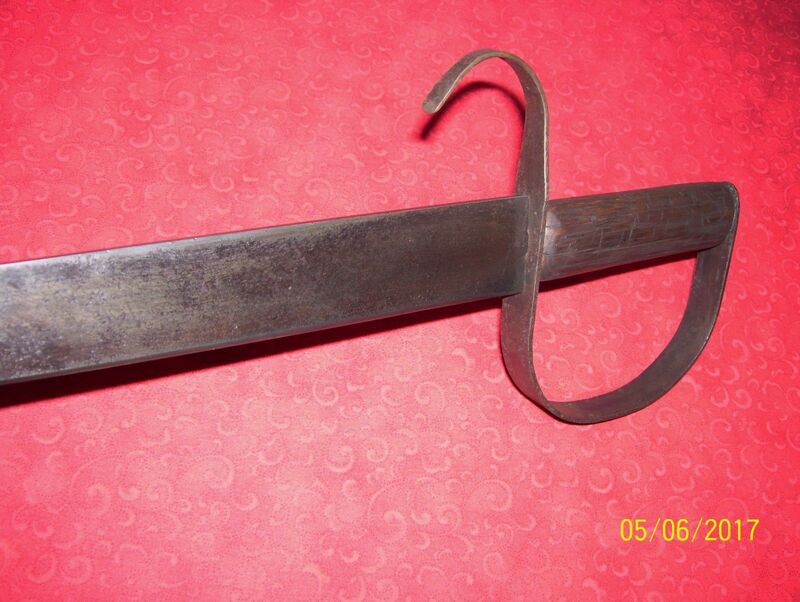 My overall impression is that it is or was a naval purpose sword due to the aggressive quillon, rust-stop paint, and short length. 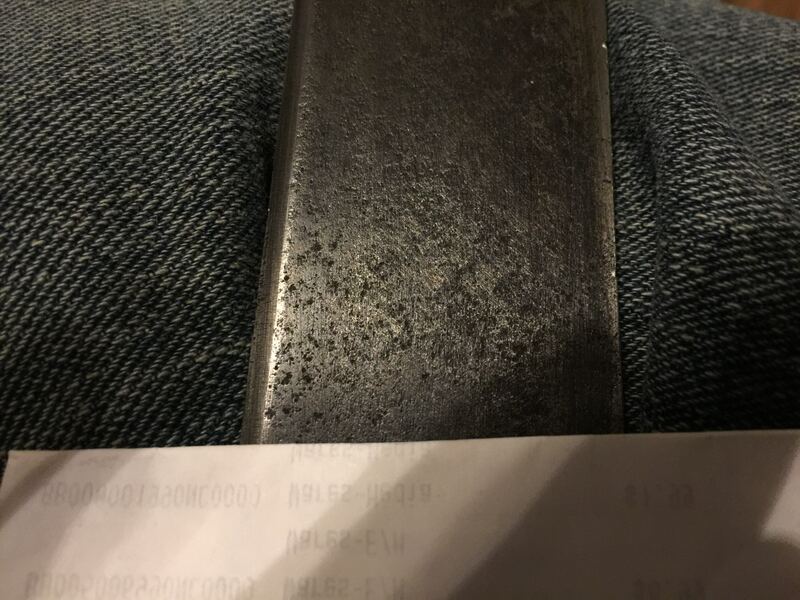 I thought perhaps it was an English pattern of 1804 cutlass, modified in obsolescence to make it useful again, maybe around the Civil War, but it looks like the P1804 has a much thicker spine. Any help would be most appreciated. Swords are not my area, so I don't have the advantage of intuition. All I can tell for certain is that it's at least 50 years old. If it turns out to not be anything in particular I will probably use it as a brush knife, I like having D-guards on my machetes. It has the look of many of the D-Guard Bowies made in the South around the beginning of the Civil War. 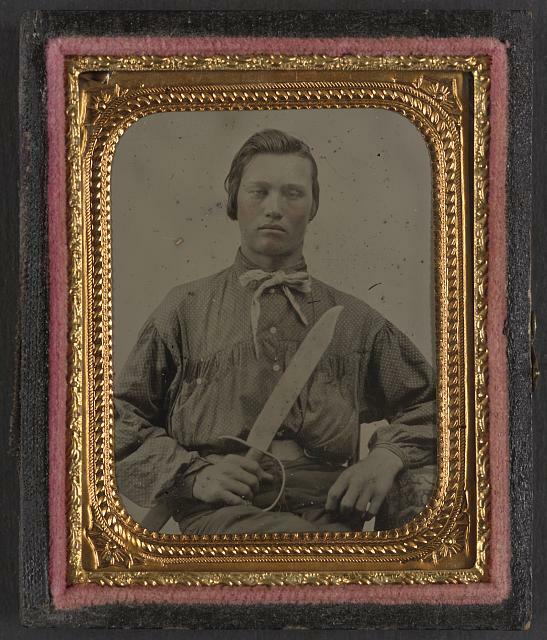 If you look at some Confederate portrait photos, a number of soldiers will be posing with them. They were often rather roughly made. They were often rather roughly made. Yeah, the overall look is bang on for a Confederate weapon (which doesn't necessarily mean that that's what this is, of course). 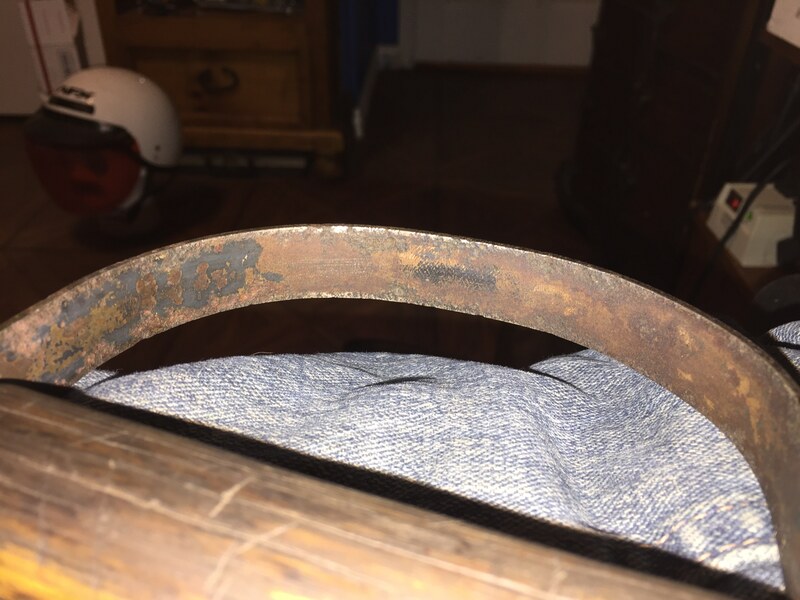 BTW, if the blade is only 1/8" thick, the same thickness throughout its length, and as flat and featureless as it looks in the photos, then it's most probably not a modified sword blade, but far more likely something like a repurposed leaf spring or saw blade. 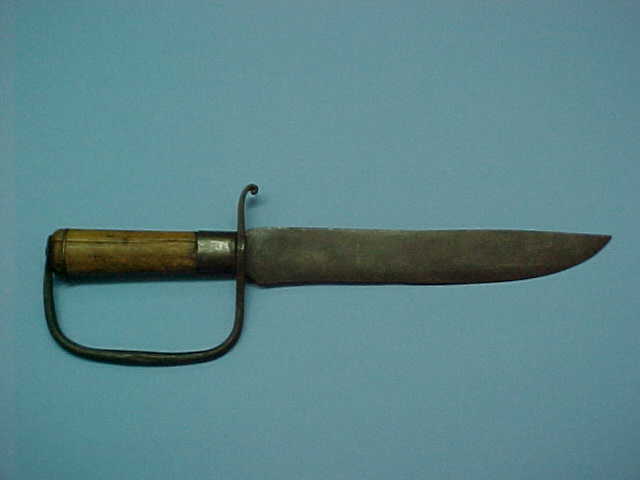 Lots of Confederate knives were made of such random pieces of good steel. Or it could be an original creation simply cut and ground from sheet metal, of course. But most probably not a shortened sword blade. There are a lot of "Confederate" bowies out there. Some are made with no intent to deceive, and some specifically as fakes. This looks to me like something made in the style of a Confederate bowie. The general shape is OK, but a lot of the finer details are atypical. For example, the blade thickness, the shape of the spine, the tapering of the grip where it meets the guard at each end, and the profile of the guard at the pommel are all a bit odd. There is a great reference book by Melton, Phillips, and Sexton with detailed photographs if you want to check out originals with good provenance. It could be legitimate, but I am inclined to think otherwise. Regardless, it is a neat knife, and does not look like junk. Just as I finished typing my last post, I had another thought. 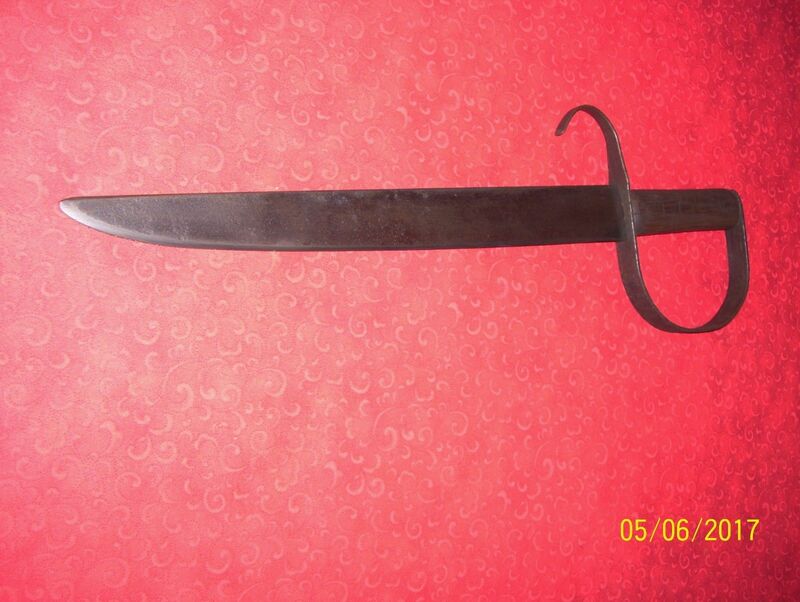 Those features I mentioned are more typical of Chinese swords of this pattern. Also, the very long recurved guard has a Chinese look. This could be a Chinese weapon from around the early 20th century, but there are others here who may know more about that specific topic. While those types of blades resemble Confederate pieces, a lot (most?) of the examples that show up are from Mexico or points south. How do I know? Back in the late 80s/early 90s there were some dealers and collectors going to Mexico and buying up any and all old edged weapons that they could find, and a lot of what they came back with matches the so-called "Confederate" knucklebow Bowies. I remember a table at the Great Western Gunshow where I watched a dealer unload crate after crate of edged weapons that he had aquired on a trip to Mexico: he had at least 100 pieces literally piled on his table. Some were Espada Ancha of varying dates and styles, some were later Mexican swords, and a LOT of them were these Bowie type knives with knuckleguards. A year or two after seeing that one dealer's haul from Mexico, a different dealer showed up with several of these Bowies, all being advertised as Confederate, all with astronomical prices. I asked him if he had picked them up from the first dealer's Mexican pile, and I thought he was going to have a stroke! How dare I suggest that these were Mexican! These are obviously Confederate! So maybe he had purchased them thinking that they were Confederate, and maybe he was just claiming that they were Confederate to maximize his profits. Is the OP's Bowie Confederate or Mexican? I couldn't say. It could be either, and without a provenance linking the knife to use by the Confederacy, there's not going to be a clear cut answer. I found a very very faint impression of an F about a quarter of the way up on the left side of the blade. It looks like there may have been other letters around it, but they (and the F for that matter) could just be pitting fooling my eyes.. I tried to take a picture but it doesn't come through. I too thought Confederate when I first saw it - but I know better than to get my hopes up that way. Interesting thoughts on a Chinese or Mexican origin. Could the F, if it is an F, rule out China? It may be fashioned from a buggy spring indeed, but I think it's too thin to be a car spring - which is normally 1/2 thick. The blade doesn't seem to offer much flex though and I feel like if I pushed it hard enough to test that it would break or bend. I don't know how much flex would be appropriate for a real knife of this type, but my only longsword has a very good, very flexible blade, and this is leagues away from that. 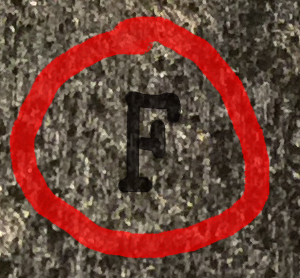 Here is my best try at taking a picture of the F.
The same spot looks almost like an N, too, so it may just be a trick of the pitting. What do you guys think? It isn't Chinese, or at least isn't traditional Chinese. The blade geometry is very wrong, the style of the grip is wrong, and the grip is too long. Looks like a fairly modern piece (mid-20th century?). Since the blade has a stamped mark, perhaps it's made from a machete. 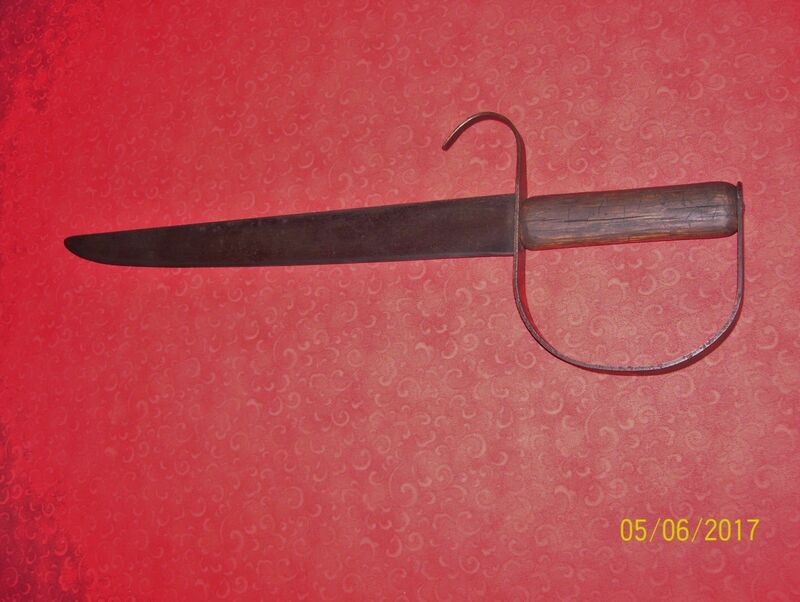 The blade is 15 inches long and the hilt is 5, for an overall length of roughly 20 inches.